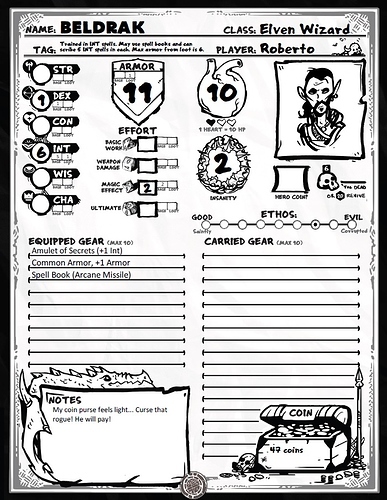 I played around with the character sheet and melded the official with some old school one Hankerin put out a while back. I added in bits for insanity and morality tracking (which I will be experimenting with in my next campaign). It also now has a portrait field (ratio of like 1.6 by 1.95 or 128w by 156h). EDIT: Hmm, portrait function works well in acrobat but in the reader it seems you need to convert the image to pdf first then import it. EDIT2: OK, this might be the final version… at least for a while. Clickable hearts! EDIT3: For those using mobile devices to access this sheet, I find Foxit to be the best app. It has all the functionality and it runs super fast. None of the mobile apps Ive tried have an easy time importing the portrait - that may best be done on a PC. Here is an alternate one with a sanity mechanic similar to the one in the “Beneath the Door” adventure. Its not something I would use but its there for folks who like really unified mechanics. Nice mate. Feel like making one up for magic users with the new system? Hehe, I probably won’t be using the new system. But I will be making one for magic users using old system. If I can post the full one, I will. Not sure if I can since I modded the official sheet. Then folks can monkey with it more. 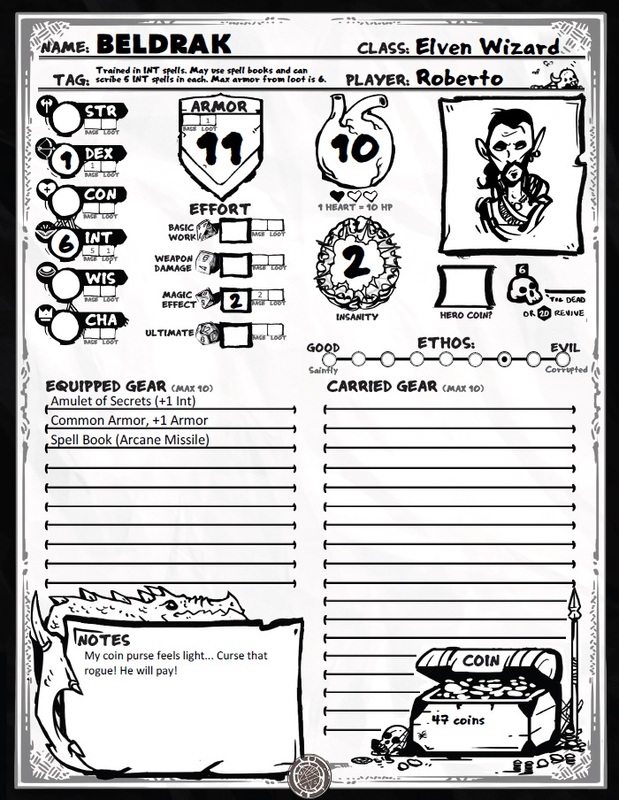 There’s no reason you can’t post a character sheet for the community to use. Great work! Like I said, its just a mod of one Hankerin posted before. I just made it full sized. Here is a LINK to it. I might make it form fillable later. I have a Tag field since I plan on giving each player a character specific minor power. Like I mentioned, there are Insanity and Morality fields as well. Form fillable versions linked in a post below. Again, credit goes to Hankerin. He put out a 8×5 version. I just made it bigger, moved stuff around and added a couple widgets. Ok, working on a form fillable version next. It will calculate stuff by adding the base and loot fields together. It will also all auto resize text in text fields. This is awesome. I really dug the one Hank originally released, and I love how you’ve modified it. Thanks for sharing it. OK, two form fillable variants have been added. The first does not allow the user the add a value for insanity above 5 (the cap in the insanity rules I will use) or an armor loot value above 10 (the default loot cap). The second has no such caps. Both pdfs do not display zeroes. This reduces clutter. There is no space for bio-form. I will be listing it with class (Elven Wizard, etc) in my upcoming campaign. The lines at the bottom are somewhat well spaced but not very. This is by design. Edit: Updated the sheets with fillable fields for hp, the hero coin and the death timer. The more I thought about it, I figured people who use phones and tablets can just use their device if those fields are there. It works well on my laptop but isn’t as great on the phone for some reason. The Xodo reader works ok on my phone; Foxit works better. Sorry, hehe. OK, in this one I added the ability to easily add portraits. Ratio needs to be like 1.6w by 1.95h (or 128w by 156h). I also moved the HEART to be level with the SHIELD. I just updated the one without limits since that seems more popular. OK, this might be the final version… at least for a while. Clickable hearts! Thanx, I use sanity on all my players. Great work, thanks for your contribution! absolutely awesome use of fonts here!